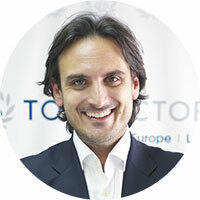 Alberto established Top Doctors in 2012 with Lorena Bassas. He is the CEO and brings more than 20 years of experience in the pharmaceutical and healthcare industries to the role, including international senior positions in various European countries and emerging markets. Previously, Alberto served as Director of Corporate Accounts for Allergan and Commercial Director of Italy and Director of Key Accounts for EMA for Johnson & Johnson. Alberto is passionate about enabling patients to be in control of their own healthcare, as well as increasing doctor’s visibility in the digital world using the new technologies available. This passion sits at the very heart of Top Doctors.